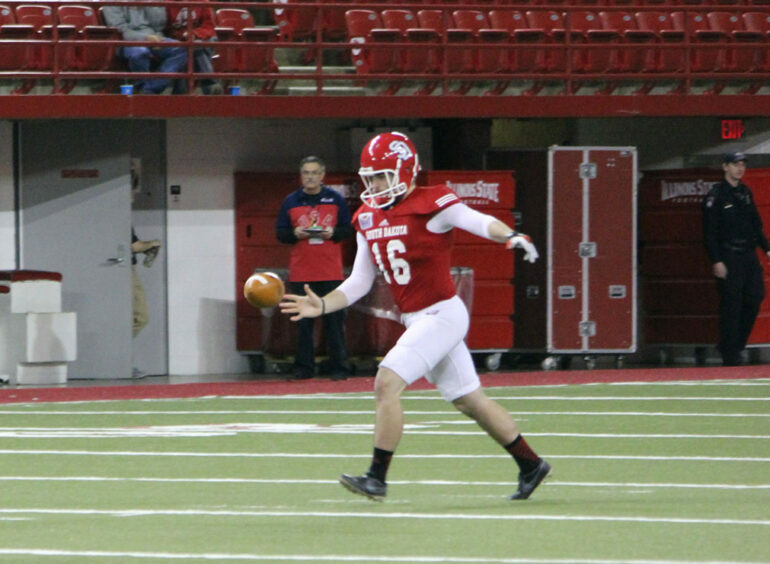 In a season with low scoring matches and a 2-9 record heading into its final game, one distinct bright spot has emerged in the University of South Dakota football team — kicker Miles Bergner. Bergner is currently perfect (16-16) on field goal attempts this year and 17-19 on extra point tries. He suffered a concussion in the Nov. 15 home game, but he expects to be available for rival South Dakota State Saturday in Brookings. These numbers are what kickers strive for, but Bergner is not satisfied. In his first season with the Coyotes, Bergner was 12-21 on field goals and 21-23 on extra points. Bergner said the reason for his improvement was his confidence. The difference in Bergner from year one to year two is clear, his coaches said. Glenn said Bergner’s performance this year is not surprising to him — there’s reason for Bergner’s impressive numbers. Bringing showtime to the Coyotes program was not easy, Glenn said. Bergner was considering other routes in life before deciding to come to USD. Glenn laughed as he remembered enticing Bergner to choose South Dakota. While all of his accomplishments on the field are becoming known, Bergner said he is quite different off the field. He said he plays with some zen, but he enjoys off-the-field antics. His teammates are behind him and his antics — as long as the field goals keep scoring. Glenn echoed his players’ assessments, saying Bergner is the guy having fun. Glenn said Bergner is the guy always spewing facts on the road.